Below is a complete look at all 5 of Roberto Luongo's true rookie cards from the 1997-98 hockey card season. In order to carry an official "RC" tag (true rookie), a card must be part of a product's base set as opposed to an insert or parallel set. 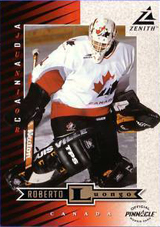 Luongo's RC's come from a simpler time, when the cards were over-printed, yet the amount of options were fewer than today. The Canucks star was also a rookie prior to the pack pulled rookie auto revolution truly took off, which is why he doesn't have a true rookie auto. Parallel = A card that is an alternate version of a base card that is harder to find than the base version. However, these do not carry a true "RC" tag because they are not part of the base set.